Does God help you with dominoes? I had to leave and I did not want to rush the answer. That is why I punted to the time of this writing. So the very short answer is YES! 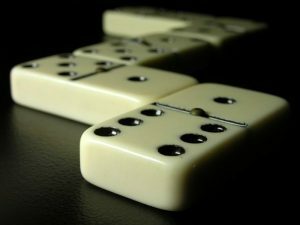 God helps you with dominoes: Look at you! God called you out of the house this afternoon. God said get out and don’t worry about dusting or dishes. God wants you to be connected this afternoon and have a good time with people you enjoy being around. God uses dominoes to help you not be home alone. God uses dominoes to help you bring joy to others.